BRAND NEW! Fits '92 & up. 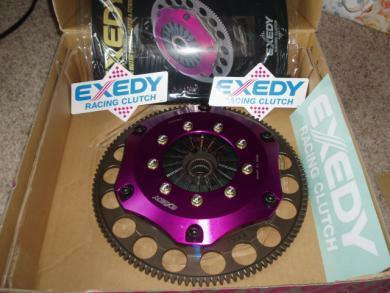 asking $1,050/ obo..
For high-powered applications EXEDY offers Multi plate clutches. These are designed for hot street action as well as drag, road, & rally racing. All of our multi plate clutches come with a lightweight chromoly steel flywheel, & the famous purple anodized forged aluminum clutch cover. Depending on the application, both strap drive & lug drive models are available. All have T5001 cerametallic friction materials for extreme heat resistance. The multi plate clutches are rated up to 800+ foot pounds of torque at the flywheel & come with spring damper or solid discs depending on the application. Payment & Shipping: Buyer pays for shipping. Payment made only through Paypal & will ship only to U.S.